Here are the ingredients you will need. 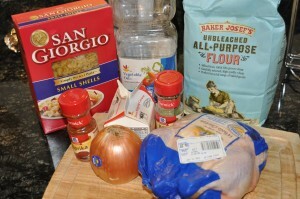 Besides the chicken and cream, you will also need an onion, spices and some pasta for the side. 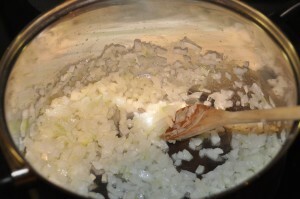 Chop up the onion pretty fine and stir on a medium-hot oil until it turns golden and transparent. 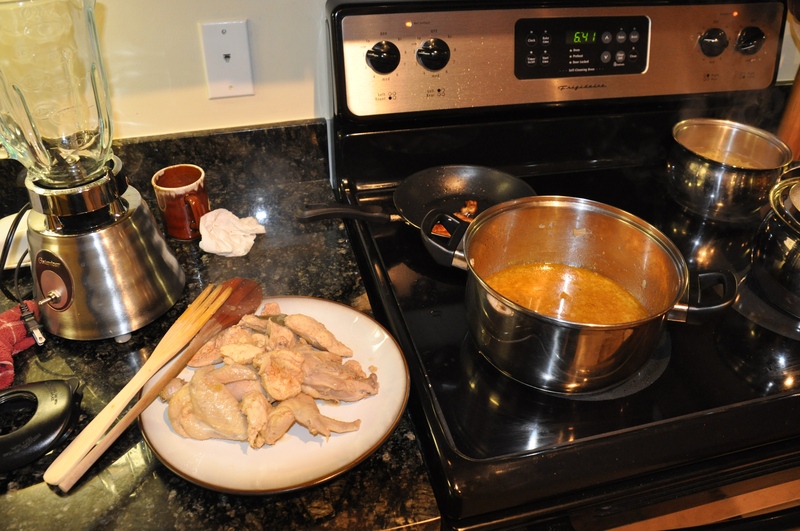 In the mean time, wash the chicken and cut it into major pieces, such as legs, wings, and few cuts of the breast meat. Add to the pot. 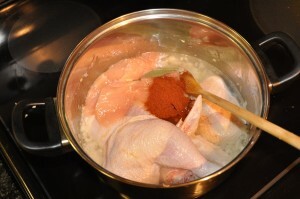 Also add one teaspoon of paprika, salt, and one bay leaf. Cover with water. I used approximately 12 oz. Stir and mix well and then cover. 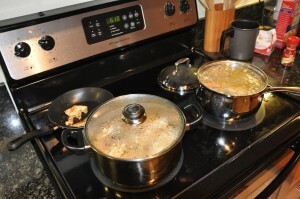 Reduce heat once the water comes to a boil. 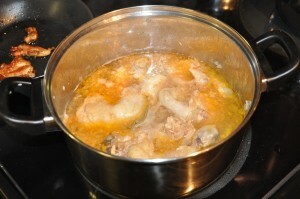 Continue stewing for about 45 minutes. In the mean time, I used the leftover bones and the giblets to make a delicious chicken soup. I also fried few pieces of the chicken skin for a tasty snack. When the chicken is ready (after about 45 minutes), boil salted water and cook the noodles. Then remove the meat and set aside. This is optional, but if you have a blender, carefully blend the hot liquid for a smoother sauce. 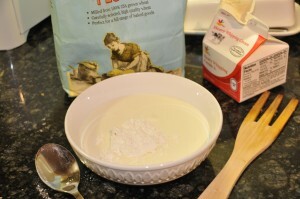 Then dissolve a heaping tablespoon of flour into the cream. Stir into the sauce. Bring the sauce back to a boil and then add the chicken back to warm it up. If the sauce is too thin, you can thicken it by adding more flour or Wondra. 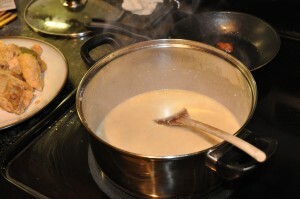 And if it is too thick, you can thin the sauce by adding milk. Serve over pasta. Enjoy! A family favorite! My mom always made halusky to go with this. 2) Neither of my daughters matured at an early age. Perhaps this is due to the hormone – free chicken products we consume, perhaps not. In my opinion, their health is worth the investment. I can’t wait to try this chicken recipe! What is the difference between this dish and chicken paprikas? Hi Lubos, try to do this and put it in English. I wonder what you would use as a replacement for Lucina. Maybe cream-cheese? I am slovak and enjoy reading the recipes. 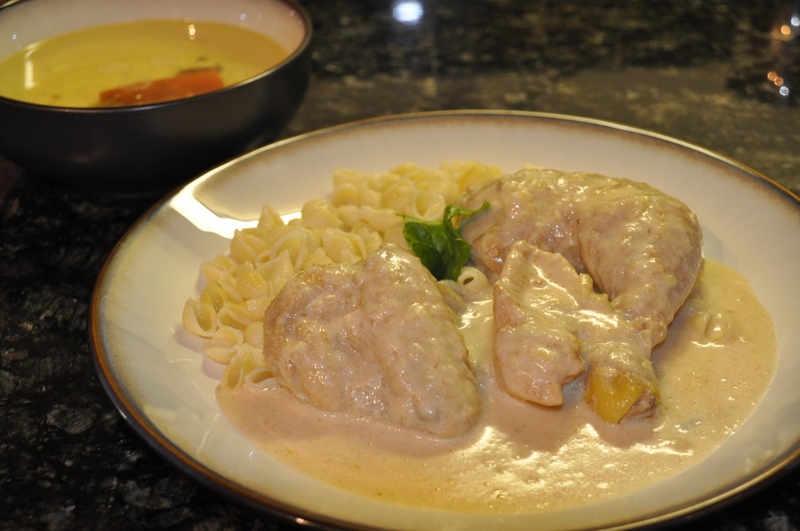 this is chicken paprikas with cream! I never had chicken paprikas with cream but I have to try it! looks wonderful!